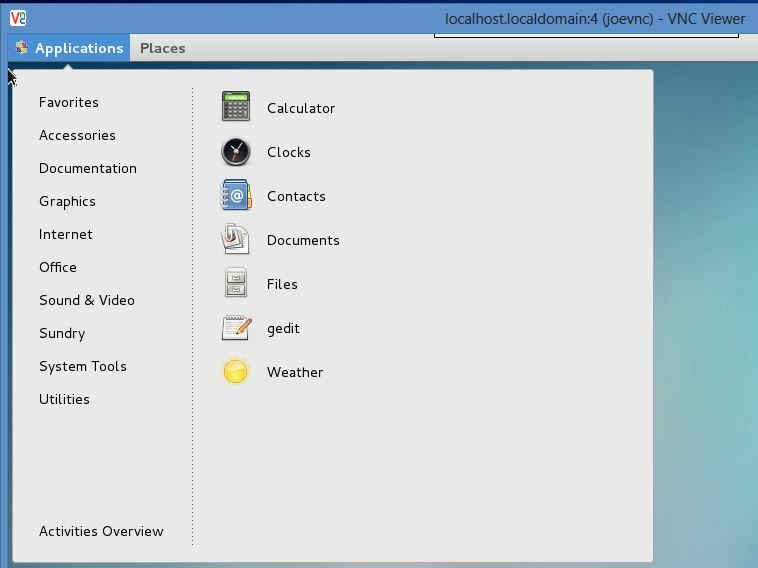 To demonstrate how VNC works, we will also install the GNOME desktop on your CentOS server. We will create two user accounts and configure VNC access for them. We will then test their connectivity to the remote desktop, and finally, learn how to secure the remote connection through an SSH tunnel. Warning: You should not run any commands, queries, or configurations from this tutorial on a production Linux server. This could result in security issues and downtime. First, we will create two user accounts. These accounts will remotely connect to our CentOS 7 server from VNC clients. Changing password for user joevnc. sudo yum groupinstall -y "GNOME Desktop"
Depending on the speed of your network, this can take a few minutes. If you don’t see this error and the boot process is smooth, all the better – you can move on to the next step. TigerVNC is the software that will allow us to make a remote desktop connection. Now we have VNC server and the GNOME desktop installed. We have also created two user accounts for connecting through VNC. So why is it disabled? That’s because each user will start a separate instance of the VNC service daemon. In other words, VNC doesn’t run as one single process that serves every user request. Each user connecting via VNC will have to start a new instance of the daemon (or the system administrator can automate this). CentOS 7 uses the systemd daemon to initiate other services. Each service that natively runs under systemd has a service unit file that’s placed under the /lib/systemd/system directory by the yum installer. Processes that get started automatically at boot time have a link to this service unit file placed in the /etc/systemd/system/ directory. So why did we add two numbers (along with the colon) in the copied file names? Again, that comes back to the concept of individual VNC services. VNC by itself runs on port 5900. Since each user will run their own VNC server, each user will have to connect via a separate port. 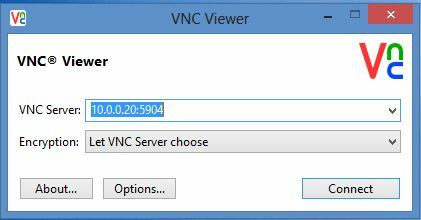 The addition of a number in the file name tells VNC to run that service as a sub-port of 5900. So in our case, joevnc‘s VNC service will run on port 5904 (5900 + 4) and janevnc‘s will run on 5905 (5900 + 5). A look at the “Quick HowTo” section tells us we have already completed the first step. Now we need to go through the remaining steps. The comments also tell us that VNC is a non-trusted connection. We will talk about this later. ExecStart=/sbin/runuser -l joevnc -c "/usr/bin/vncserver %i -geometry 1280x1024"
ExecStart=/sbin/runuser -l janevnc -c "/usr/bin/vncserver %i -geometry 1280x1024"
Next, run the following commands to reload the systemd daemon and also to make sure VNC starts up for two users at boot time. Now you’ve configured two VNC server instances. Next, we will need to configure the firewall to allow VNC traffic through ports 5904 and 5905 only. CentOS 7 uses Dynamic Firewall through the firewalld daemon; the service doesn’t need to restart for changes to take effect. We are one step away from seeing VNC in action. In this step, the users will need to set their VNC passwords. These are not the users’ Linux passwords, but the passwords to log in to the VNC sessions. Open another terminal connection to the CentOS 7 server, and this time log in as joevnc. Let’s look at the line New 'localhost.localdomain:1 (joevnc)' desktop is localhost.localdomain:1. localhost.localdomain was the server name in our example; in your case it could be different. Note the number after the server name: (1, separated by a colon). It’s not the number in joevnc‘s service unit file (which was 4). That’s because this is the display number joevnc‘s session will run on in this server, not the port number of the service (5904) itself. You should see similar output showing that janevnc‘s session will run on display 2. 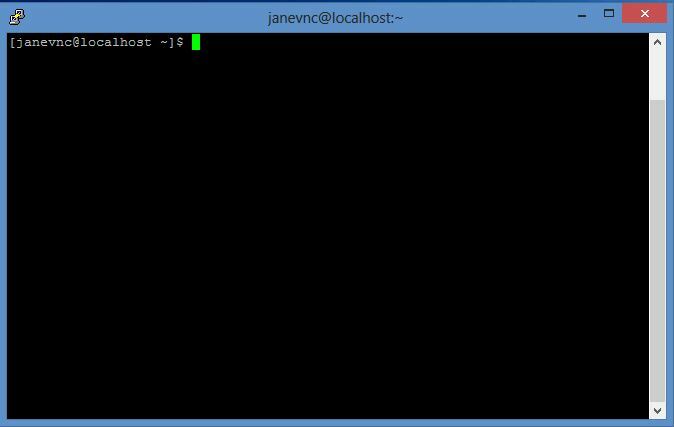 For this tutorial, we will assume users joevnc and janevnc are trying to connect to the CentOS 7 server from their Windows computers. They will each need a VNC client for Windows to log into the remote desktop. This client is just like a terminal client like PuTTY, except it shows graphical output. There are various VNC client available, but the one we will use is RealVNC, available here. VNC Viewer for Mac OS X is available for download on the same page, and the Mac version is fairly similar to the Windows one. In the VNC Server field, add the IP address of your CentOS 7 server. Specify the port number 5904 after the server’s IP, separate by a colon (:). We used 5904 because that’s the VNC service port for joevnc. Enter joevnc‘s VNC password that you set earlier. Accept the default welcome message. You can leave this desktop connection open. When janevnc logs in via VNC Viewer, an empty desktop with a welcome message is shown, just like it was shown for joevnc. In other words, the two users are not sharing the desktop instances. joevnc‘s desktop should still be showing the calculator. To close the remote desktop session, simply closing the window will do. However, this doesn’t stop the user’s VNC service in the background on the server. If the service is not stopped or restarted and the machine had no reboots, the same desktop session would be presented at the next logon. 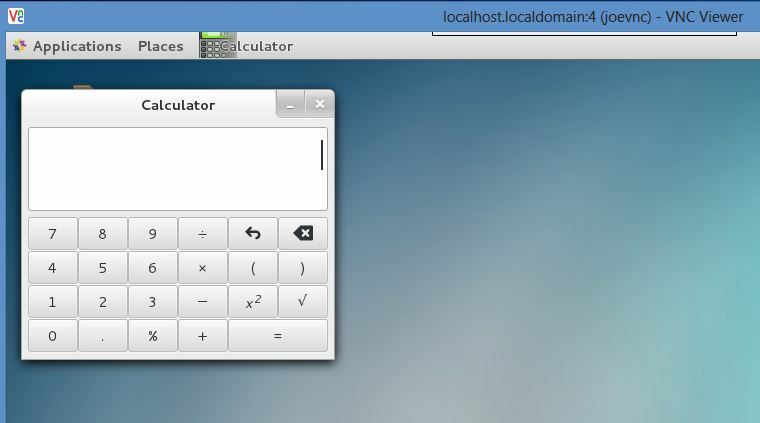 If you wanted to log back into joevnc‘s desktop at this point, you’d see the same calculator app open. This presents some interesting challenges for system administrators. If you have a number of users connecting to the server via VNC, you may want to devise some way to stop their VNC services when no longer needed. This may save some valuable system resources. Job for [email protected]:4.service failed. See 'systemctl status [email protected]:4.service' and 'journalctl -xn' for details. Nov  7 00:08:36 localhost systemd: Failed to start Remote desktop service (VNC). Nov  7 00:08:36 localhost systemd: Unit [email protected]:4.service entered failed state. Although relatively rare, you may encounter other errors when working with VNC. For example, your remote desktop screen can go blank or hang, the session might crash with a cryptic error message, VNC Viewer may not connect properly or transmit commands to the GUI to launch applications, etc. We recommend checking the /var/log/messages file to get a better understanding. At times you may need to reboot your server, or in extreme cases recreate the VNC service. System resources can also be a culprit; you may have to add extra RAM to your Droplet, etc. So far both joevnc and janevnc have been accessing their remote desktops through unencrypted channels. 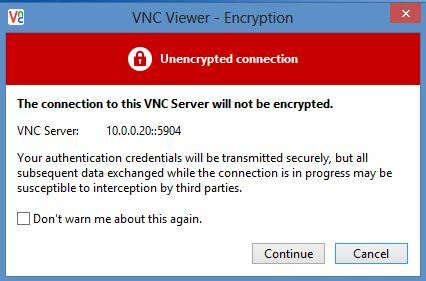 As we saw before, VNC Viewer warns us about this at connection time; only the password is encrypted as the sessions begins. Any subsequent network traffic and data transfer is open for anyone to intercept in the middle. This is where Secure Shell (SSH) sessions can help. With SSH, VNC can run within the context of an SSH encrypted session. This is known as tunnelling. In effect, VNC traffic piggybacks on the SSH protocol, resulting in all of its communication with the server being encrypted. It’s called tunnelling because SSH is providing wraparound protection over VNC and VNC is running as if in a tunnel within SSH. SSH tunnelling can be used for other protocols like POP, X, or IMAP as well. 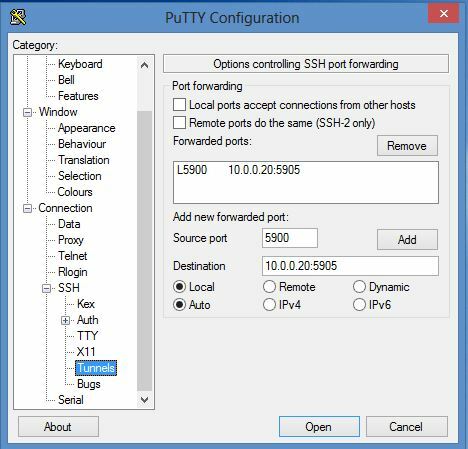 SSH tunnelling works with port forwarding which is basically a means of translating access from one particular port to a different port on another machine. With port forwarding, when a client application connects to Port A running on machine A, it’s transparently forwarded to port B running on machine B. The client application is unaware of this translation and thinks it’s connecting to the original port. Port forwarding is one of the features of SSH protocol. For more detailed information about SSH tunneling, read this tutorial. In this tutorial we have configured VNC to run on ports 5904 (for joevnc) and 5905 (for janevnc). With port forwarding, we can set our local VNC client to connect to port 5900 on the local client computer, and this can be mapped to port 5905 on the remote server. This is example is for janevnc‘s connection, but you could easily follow the same steps for any other clients. When the VNC client application starts, it can be pointed to port 5900 on localhost, and our port forwarding will transparently transport it to port 5905 on the remote server. Note: You’ll have to start an SSH section each time to make the connection secure. On your Mac, open Terminal. Enter janevnc‘s UNIX password. The connection will appear to hang; you can keep it running for as long as you use the remote desktop. 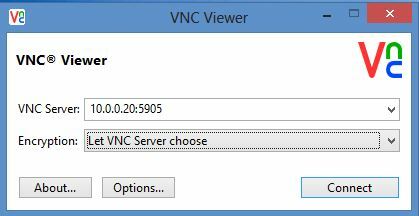 Now skip ahead to the VNC Viewer instructions. For securing janevnc‘s VNC session, we will assume the local Windows computer has PuTTY installed. 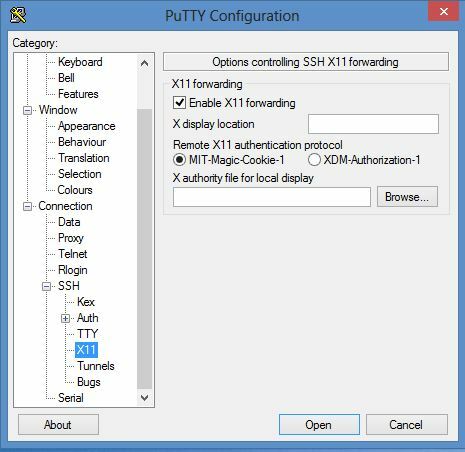 PuTTY is free and can be downloaded from here. If janevnc‘s VNC and terminal sessions are not closed already, close them now. Finally, select SSH > Tunnels. Type 5900 in the Source port field. In the Destination field, specify your server’s name or IP address, followed by a colon and the VNC port number for the intended user. In our case, we have specified your_server_ip:5905. Alternately, you could use port 5902. The 2 in this case would be the display number for janevnc (remember the message displayed when janevnc ran the vncserver command). Click the Add button and the mapping will be added under Forwarded ports. This is where we are adding port forwarding for the SSH session; when the user connects to localhost at port 5900, the connection will be automatically tunnelled through SSH to the remote server’s port 5905. You will still get the dialogue box warning you about an unencrypted session, but this time you can safely ignore it. VNC Viewer doesn’t know about the port it’s being forwarded to (this was set in the SSH session just started) and assumes you are trying to connect to the local machine. Accepting this warning will show the familiar password prompt. 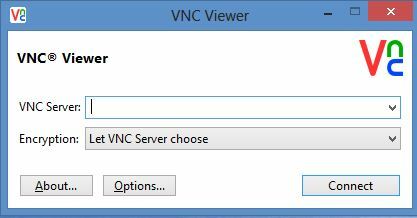 Enter janevnc‘s VNC password to access the remote desktop. So, if the localhost:5900 connection works, you can be confident that the connection is encrypted. Remember that you will want to establish the SSH connection first every time you use VNC, to make sure your connection is always encrypted. 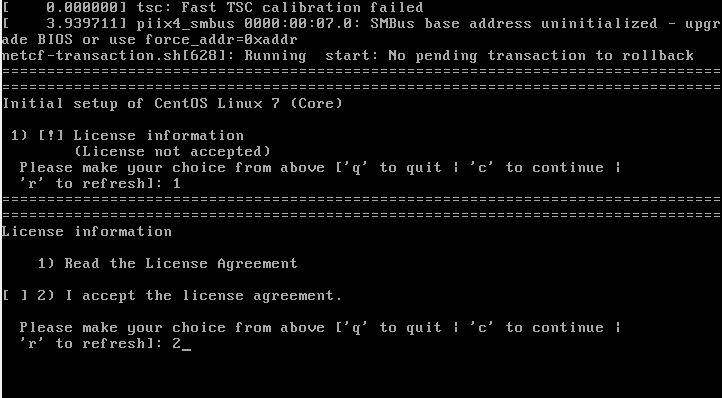 Accessing your CentOS Linux system from a GUI front end can make system administration much simpler. You can connect from any client operating system and don’t have to depend on web-based hosting control panels. VNC has a much smaller footprint compared to most control panels. Although we have shown how two ordinary users can connect with their VNC clients, that’s hardly practical in serious production environments. In reality, users will have customized applications or browsers for accessing the server. Running a number of VNC services for each user also creates an unnecessary burden on system resources, not to mention the inherent risks associated with it. If you decide to install and run VNC on your production Linux server, we strongly recommend using it for administrative purposes only.